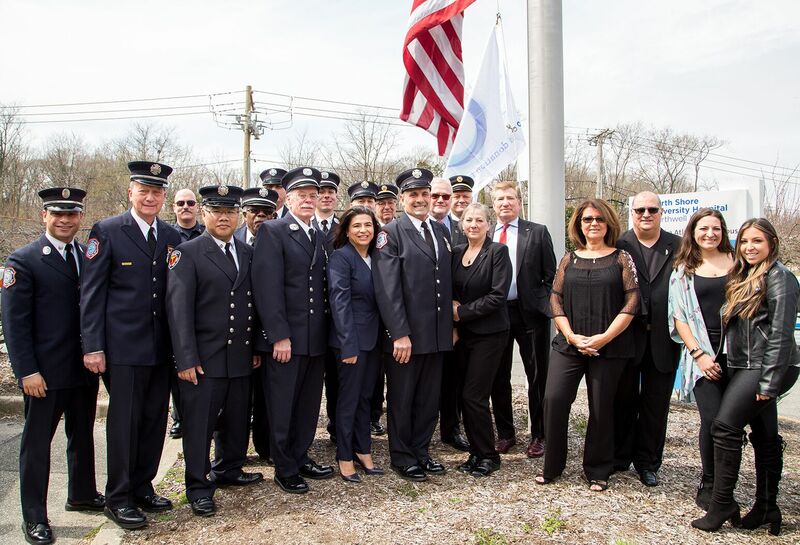 Northwell Health leadership, joined by State Senator Anna Kaplan (center) , donor families and volunteer firefighters gather for a flag-raising event at North Shore University Hospital to honor organ and tissue donors and their loved ones. Two families whose lives had been touched by kidney disease and compassion revealed their most personal thoughts about organ donation and transplantation during Northwell Health’s annual Gift of Life celebration. Before introducing each speaker, Lewis Teperman, vice chairman of surgery and director of the Northwell Health Transplant Center, urged the audience to spread the word about the importance of organ donation. On hand to lend her support from local government was State Senator Anna Kaplan (D-Great Neck). During her remarks, she, too, urged New Yorkers to sign up for organ donation while noting the fact that New York ranked 50th out of all 50 states when it comes to the number of people registered as organ and tissue donors. Dr. Teperman next introduced Pete Prudente, 59, of Glen Cove, LI, and his wife, Allison. Mr. Prudente’s mission in life has always been to help others. For years, he generously donated blood and platelets. As a volunteer firefighter, Mr. Prudente continues to serve his community with pride and distinction. On March 25 (which also happens to be his birthday), Mr. Prudente chose to become an altruistic kidney donor. What makes his story so remarkable is that Mr. Prudente’s blood type is B-negative – the same as his wife, Allison. Before coming in to donate a kidney, Mr. Prudente sat with his wife and discussed the fact that, should she need a kidney in the future, he would be unable to assist. Given the fact that B-negative patients can only receive from B-negative donors, this was a major consideration. Rounding out the program were Paul Monno, 59, of Wantagh, LI, and his wife Heloisa. Mr. Monno was just 35 when he was diagnosed with polycystic kidney disease. Exactly 20 years later, the happily-married Monno went into kidney failure. His wife and sister rallied around their loved one, offering to be tested in the hopes of supplying him with a kidney. Mrs. Monno was a perfect match.